The National Glove Company was the first glove company that William and Rebecca Pinkham started in in 1904. 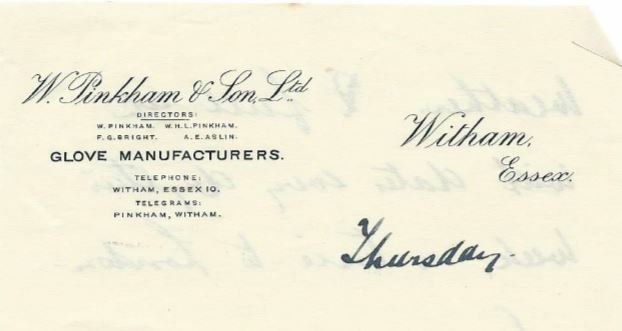 This letter heading is from the late 1920s showing William, Rebecca and their son Leslie as directors. Following The National Glove Company's bankruptcy in 1931 during the recession W H Pinkham & Son Ltd was incorporated in 1932. This letter heading is from a letter written by hand by Leslie Pinkham. This is headed note paper letter that was hand written by Leslie Pinkahm in 1934. Typed in 1938 this letter was from Leslie Pinkham to his son John who was working in Germany. This headed paper dates from the 1960s and was the final incarnation which was in use when the company closed in 1966. It shows how the company had diversified into manufacturing blouses and other garments. This envelope was used to mail out a self sew glove kit. See more about the campaign in Sew it Yourself of the Marketing section.